What can the marshmallow test tell us about the marketing of mobile phone contracts? People often remark that buying into the latest technology now provides better value for money. Now old tech has certainly become more affordable. Televisions and CD players can all be bought for a fraction of what they cost 20 years ago. But these don't come under the same bracket as the latest and greatest must have new gadgets. Gaming has supposedly become more affordable than ever. Or has it? 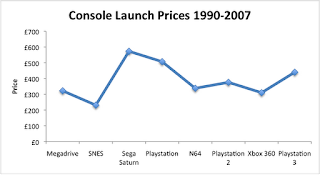 Lets compare the launch price of some consoles from 1990-2007. 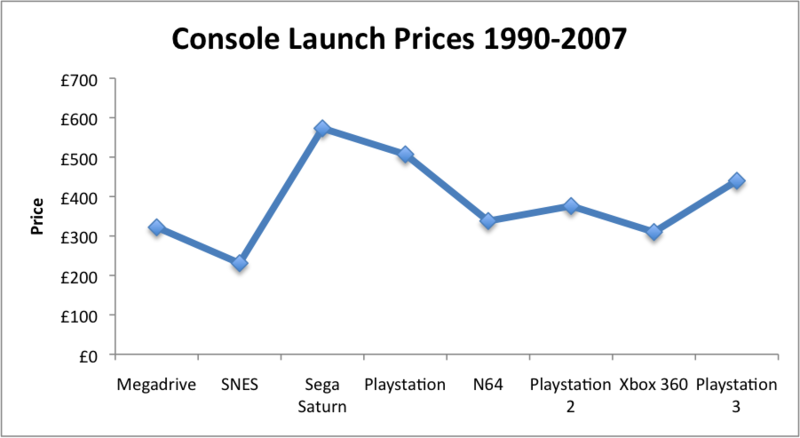 After correcting for inflation, prices have actually remained relatively static and appear to fluctuate as a console embraces a significant new technology. For example, CD based systems show a spike as do those that were early adopters of Blu-Ray. I appreciate that this doesn't take into account how prices change over a consoles lifetime, but it gives a better measure of how much cash someone would have to part with if they wanted the latest bit of kit. If you apply a linear trend line to this data, you also find that there has actually been a gradual increase in the cost. On the plus side, buying a console today means you also inherit a DVD and/or Blu-Ray player so a increase in cost can easily be justified. Yet software often drives hardware and I don't need a graph to illustrate that video games have actually become cheaper and represent better value for money than they did 20 years ago. It is a myth that gaming has become more expensive and that's before you include downloadable games that cost considerable less than physical media. Prices and availability are also made clear from the outset. It is easy enough to check how much games will cost before choosing a console. This seems fair to me. If you want this, pay x up front and if you want more here is what it will cost you. Anyone can make an informed decision quickly. Unfortunately for consumers, some areas of everyday technology have become a confusing and somewhat delayed expense that offers comparatively poor value for money. Nowhere has this become more prevalent than in the marketing and selling of mobile phone contracts. Phones are often free at the point of sale, but data costs and a lack of contract flexibility are pushing up the total end price. The average contract has become longer and that's fine if it reflects good value for money. It doesn't. Customers are often tricked into paying for data plans they will never use simply to get a free phone. These data plans also don't take into account that 3G reception in the UK is far from perfect. This coupled with a lack of decent competition from the mobile networks means that customers are stuck paying for something that results in a net loss. It's a nice bit of marketing. The customer probably feels like they are getting a better deal at the time and will leave the shop feeling happy. The truth is that they will either not use most of their data allowance or be unable to do so due to network limitations. This is before you get into the large percentage of phones that are easily damaged or stolen. Many of us are walking around with something that costs more than a games console, but remains extremely fragile and rarely insured. I'm sure there are several experiments hidden in this. Find out peoples' actual mobile phone usage and then see what deal they are most likely to plump for off the bat. Odds are that most people opt for a deal that far exceeds their actual data usage, but gives them a nice new free phone up front. This clearly happens all the time, but I wonder what individual factors might account for those who opt for the big early reward or wait and save money further down the line? I would also love to see a measure of how much data use peaks when an individual purchases a new phone and measure how many weeks it takes for data use to settle down to an average that is practically zero. Like games consoles, smart phones are a considerable advancement from what we had 20 years ago, but mobile operators should be more upfront with their costs. Their should be a total contract cost next to each monthly tariff. Customers would then be able to compare deals directly without a calcualtor. It would quickly become apparant what deal offeres the best value in the long run. Network operators should also make it clear to customers what their average data usage has looked like over the previous year. Of course, maybe that would make no difference. Those who see the free phone as the main pull are likley to ignore this and forfeit any long term gain.